Go To Hell . . . And Back! Hellsgate! The name strikes fear in mortal minds and hellish hearts alike. Ruled by demons, this city seems to exist in violation of natural laws. Hellsgate does not care. For those who live here, Hellsgate serves as a prison for some and a respite from the wars of Hell to others. For those who visit, it's equal parts danger and opportunity. Hellsgate is many things . . . most of them tinged with evil. The history, economics, current population, and key features of daily life (including details in GURPS City Stats format). Understand how the city became what it is, and what to expect when you get there. A map with the location of major structures and destinations. Find your way to the Anticathedral or Perpetual Arena like a native! Details on intriguing points of interest. Visit the Fire Garden, which holds dangerous fruits that many would pay handsomely for. Explore the Bone Palace, with its numerous ingenious traps. Try your luck at one of the two distinctly different taverns, each catering to a distinctly different clientele. Notable residents: the demons, the mortals, and the undead. Their descriptions come complete with GURPS stats, as well as five templates and a new demon meta-trait. 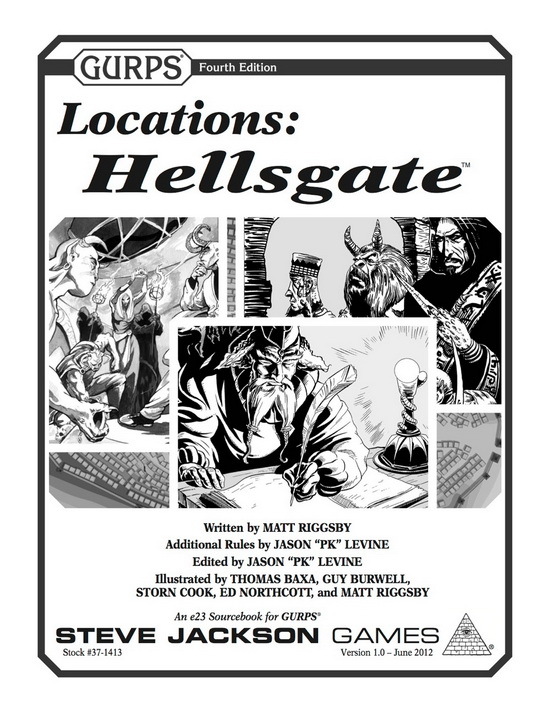 Insight into how to insert Hellsgate into your campaign, including tips for customizing the metropolis and adventure ideas to get the action started. Whether you're looking for a GURPS Dungeon Fantasy locale to loot and pillage, a subtle fantasy stopover for subterfuge and intrigue, or a permanent part of your paranormal panorama, GURPS Locations: Hellsgate presents the perfect place to visit for the time of your life! Check out the rest of the GURPS Locations series for more ready-to-use locales, including Matt Riggsby's GURPS Locations: Tower of Octavius! 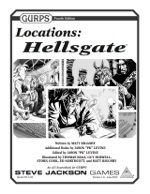 Hellsgate is a perfect place to add to a GURPS Dungeon Fantasy campaign. Storm the city and take its loot . . . if you survive!